The CranioCradle is a gentle easy to use home therapy system that helps relieve stress, tension and pain. Placed under the head, neck and back, along the spine, the CranioCradle encourages joints to decompress and cramped tense muscles to gently release. 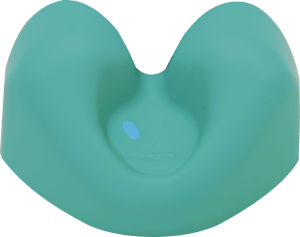 Within Minutes, the CranioCradle will relax tired tense muscles, relieve nagging aches, pains and fatigue and restore your body to a deep state of comfort. designed to compress for comfort while maintaining its natural healing shape. Designed for the athlete and plus sized. I have been teaching my Myofascial Release seminars for over 40 years now. I would like to endorse the CranioCradle, which we use both for self-treatment and also during treatment as an extra set of hands to anchor an area down so that we can more effectively release the fascia. We teach all of our patients how to treat themselves and it is a wonderful self-treatment tool. The CranioCradle is helpful for the entire spine: cervical, thoracic and pelvic areas. It’s very well made and we are all very pleased with it. shots, MRIs , mixed with Orthopedic and Neurology Specialists. days of 3-5 kinds of grades have been replaced ..Now I’m always an 8.5-9.5!! surprised as I have been. No surgery for me !!! See our full Instructional Video Library! Over 18 Applications. Use 1 CranioCradle or try 2! Based on osteopathy, craniosacral and massage therapy techniques, the CranioCradle® home therapy system was tested and fine-tuned with the collaboration of a team of experienced hands-on therapists. Which means you experience the benefits of an actual therapy session in the comfort of your own home.